On this page you can see a screenshot of the AnswerCoach. You can see the AnswerCoach with an active question session. Further functions like the statistics or the management of the question lists can be displayed by using the tabs above. In the question session, the questions are shown in the upper box. 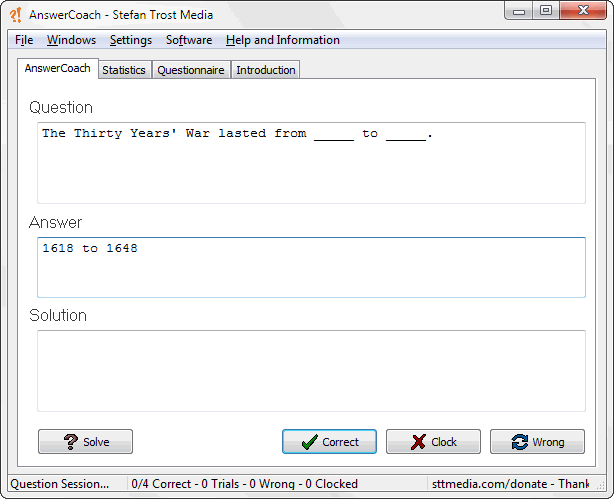 You can write your answer into the box in the middle and then you can click on "Correct", "Wrong" or "Clock". "Correct" marks the question as answered in the two other cases this question will be asked again. If you click on the button "Solve", you can see the solution in the box below.